Obama: Launch puts "enormous strains on the six-party talks"
STRASBOURG, France (CNN) -- U.S. President Barack Obama on Friday sent a public warning to North Korea, calling on Pyongyang to back off plans to launch what the United States believes to be a missile. 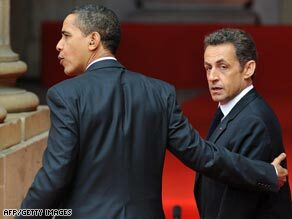 President Barack Obama and French counterpart Nicolas Sarkozy face the media in Strasbourg, France. "Should North Korea decide to take this action, we will work with all interested parties in the international community to take appropriate steps to let North Korea know that it can't threaten the safety and security of other countries with impunity," the president said at a news conference in the French city of Strasbourg. He said his administration has "made very clear to the North Koreans that their missile launch is provocative. It puts enormous strains on the six-party talks and that they should stop the launch." North Korea says is plans to launch a rocket carrying a satellite to explore space. A commentary on North Korea's state-run news agency recently blasted critics for opposing its plans. "This is nothing but a groundless outcry of the political philistines ignorant of any legality of the study of space for peaceful purposes," the commentary said. Obama said the other members of the talks -- Japan, South Korea, Russia, and China -- have also called on North Korea to forego the planned launch. While the Obama administration has been blunt in its messages to North Korea, it is carefully avoiding any suggestion that it would try to disrupt the launch. Washington is also being vague about what the potential consequences may be. Behind the U.S. tightrope act is the United States' hope of handling the situation in a way that will not endanger the six-party talks aimed at dismantling and eventually erasing North Korea's nuclear weapons program, a senior administration official told CNN on Thursday. The official said the North Koreans have pretty much backed themselves into a corner. While they may have begun the process of threatening to launch a missile to gain leverage with the United States, it is now an issue of saving face -- and they are certain to go ahead with the launch. Russia and China are less eager to impose sanctions, while South Korea and Japan want to be much tougher, the official said. Secretary of State Hillary Clinton has said that whether or not the launch happens, the United States wants to continue the six-party talks. Japan recently mobilized its missile defense system in response to the planned launch. Japanese officials said the move is aimed at shooting down any debris from the launch that might fall into Japanese territory. North Korea, in response, said it will attack the Japanese military and "major targets" if Japan shoots down the rocket, North Korea's state-run news service, KCNA, reported Thursday. CNN's Charley Keyes, Mike Mount and Elise Labott contributed to this report.